The Bank of Ireland’s two storied building located on Main Street was originally a private house and had a gated entrance on its right front leading to two stores and a rear yard which in turn led to a garden. On its left the small gated entrance led to a kitchen yard. Off this yard was a kitchen, a scullery, a larder, a pantry and a store. The property was leased by Charles Knox and his wife Jane (nee Cuffe) to Rev. Edmond Jennings PP Ballinrobe for 31 years at a rent of £3.6.0 in 1830. Rev. Jennings transferred his rights to Bridget Kealy who in turn transferred her interest to her daughter Catherine c. 1835. Catherine married Patrick Hagerty and they had two daughters Bridget and Anne. The parents died c 1846 and the two girls in due course entered the Convent of Mercy in Ballinrobe. Because of the vow of poverty as nuns, transactions for their property was handled by His Grace the most Rev. John McHale, Archbishop of Tuam and Rev. Peter Conway PP Headford, who leased it for 50 years to the Bank of Ireland. £400.00 had been paid to the nuns’ superior for their leasehold interest. The building, yard and gardens were leased to the Bank of Ireland c. 1864 for 50 years. In 1877 plans were drawn by Mr. S. Symes, Architect for a new layout of the ground floor interior to include a Cash Office, a Porter’s Office and an Agent’s Office (Bank Manager) off, which was an entrance to a Safe Office. The Knox estate was taken over in 1913 by the Congested Districts Board and the Bank bought over the interests from the Irish Land Commission in 1945. This is listed as a protected structure No. 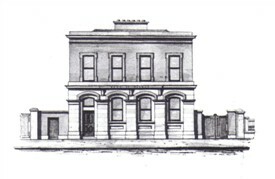 0066 by Mayo County Council whose description reads: a detached four bay two storey rendered building that this was purpose built bank c. 1865. No. 09 on BDC Town Heritage Walk. I am grateful to Mr. Norman Molloy for giving me access to original lease documents for the Bank which he had access to, as a former Bank Manager of this Branch. This page was added by Averil Staunton on 22/11/2010.